“La Purísima” is one of the most important celebrations of December in Nicaragua. It’s full of particularities that make it unique in the world. Continue reading to know more about this fascinating tradition. “La Purisima” and “La Gritería” are unique festivities in Nicaragua and each one is celebrated in a different way but, if we may say so, with the same objective: Pray and sing to the virgin for her intercession to Jesus and God for our salvation. To differentiate them we can say that the first one is more private than the second one, but both have the same goal and must have the following “elements”: Altars, songs, prayers, “gorras” and gunpowder. They both consist on decorating an Altar, inviting people to sing to the virgin and handing out different kind of gifts while fireworks are exploded. After the first Spanish conquistadors, the Franciscan friars arrived in the country with new religious beliefs. Specifically in the convent San Francisco, Leon, in 1742 these friars began to pray with people the novena and to distribute sweets and little gifts to the prayer people, but some time later there were too many people at the convent and the friars solved it by asking them to go home for praying to the virgin. Since then, the house-to-house prayers known today as “La purísima” started. Nevertheless, some documents and historians assure that by 1675 the Purísima was already celebrated in the fortress of the Immaculate Conception in El Castillo, Rio San Juan. 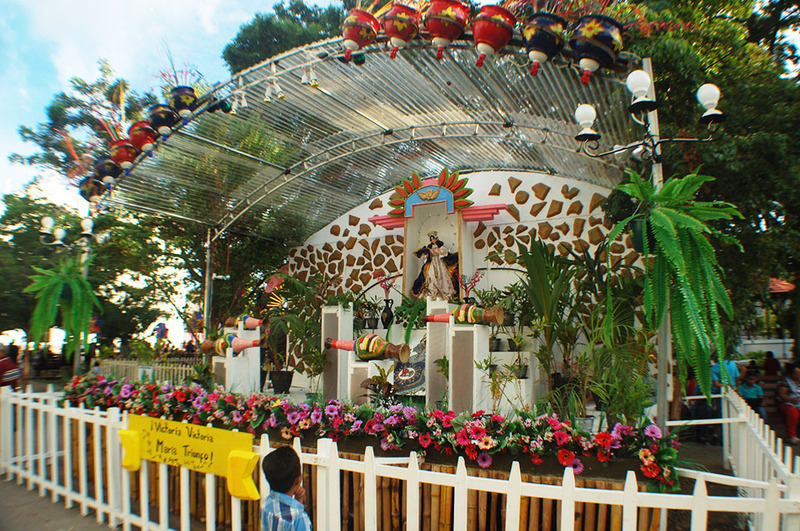 The people who want to celebrate “La Purisima” are hosts or homeowners who assemble and display a beautiful altar with flowers, candles and ornaments with the image of the Immaculate Conception of Mary. The host invites home his family, neighbors and friends to a prayer that can be on any day of December, even in late November or early January. During the prayer the guests sing to the Virgin the traditional “Marian chants”. Most of these songs are properly Nicaraguan and many of them are legacy of the composer from Masaya, Alejandro Vega Matus. One of the most popular songs, but not from Nicaraguan origin, is “Del cielo ha bajado”, known internationally as “Ave de Lourdes” from Lourdes, France. During the “Purísima”, hosts go outside to explode “triquitracas”, “cargacerradas”, rockets, fireworks or any type of gunpowder. These are small bombs that are used to further encourage the celebration. While everybody is singing, the “Gorra” or toast takes place. It is not a common toast, but the host distributes traditional Purisima gifts to the guests, including national cajetas (toffees), gofios, whistles and other things. Currently it is common to receive sugar cane, fruits, toys, even Nacatamal and other national foods or desserts. The variety of gifts has grown so much that nowadays you receive candies, plastic rags, glasses, handbags, wooden musical instruments such as maracas, matracas, whistles and many other things. This tradition has transcended borders. In countries like Costa Rica and the USA, where there is a large Nicaraguan community, hundreds of Nicaraguans continue the tradition. It is so important that many national and international companies, even government institutions, celebrate the Purísima on December. Had you ever participated in a “Purisima”? What have you received? Tell us more and share your experience!